An 1855 plat map of Marion County. John Hamilton owned my property and the schoolhouse property. 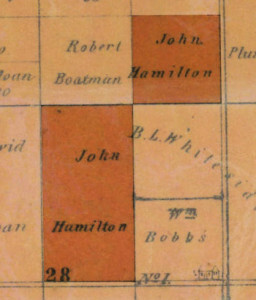 An old Marion County plat map published in 1855 shows the original owner of the property to be one John Hamilton who also owned some adjacent acreage at the corner of 30th St. and German Church Rd. For many years an old schoolhouse sat at that corner. An old-timer in the area named Paul Brinkman, whose family owned farmland in the area for many, many years and who donated land to the Indianapolis Parks Department, confirmed that the building was indeed a schoolhouse. In fact, his father had attended class there as a child. 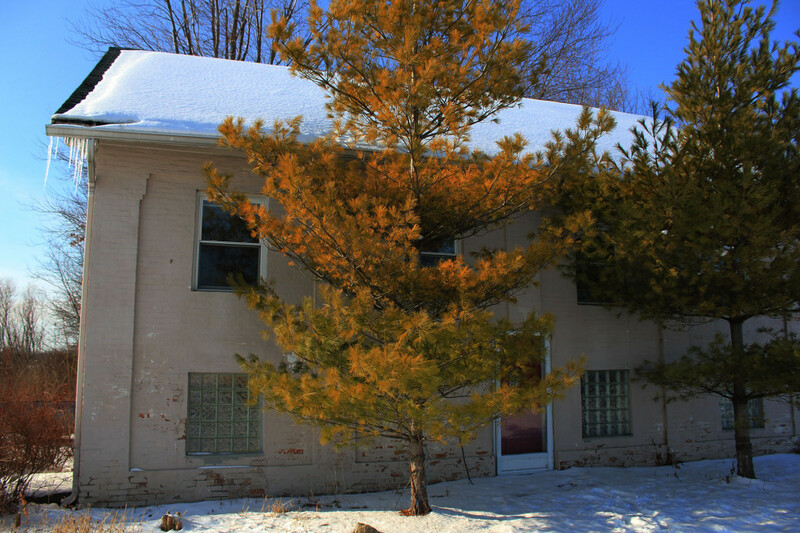 Brinkman also owned most of the woods which enveloped the schoolhouse property. These were dark woods which were never developed. At times we’d watch from our bedroom window as a police helicopter shined its light down on the woods looking for someone. Other nights I would stare out into the empty woods expecting to see a light moving. I can’t explain why I did this. I just felt some unexplained sorrow calling out to me from that forest. The distance between my house and the schoolhouse was maybe 200-300 yards. In that corridor it wasn’t unusual for vehicles to break down on a fairly regular basis. Before cell phones became commonplace, I would receive regular knocks at my front door from stranded travelers at all hours of the night, since mine was the first house they’d walk to. Once a woman, who inexplicably became sick right in front of my yard, knocked on my door to apologize for the mess. Once, before I lived there, a distraught woman wept loudly on the front porch while my ex called 911. Worse than anything though was the tragedy of a little girl who was crossing the street when she was struck and killed by a drunk driver, just seconds before I came upon the scene. That corridor seemed cursed in many ways. I would come home some nights to find the area blanketed with fog, even as the rest of the city was clear. The fog became so regular I took to photographing the surreal, fogged-in scenery at sunrise and sunset. My own property also seemed cursed in many ways. My ex recounted that on the day that she and her former husband were moving in, the front door was covered in webs with many large spiders. An admitted arachnophobe, she felt it was an omen she should have heeded. Strange how certain creatures are associated with evil. I remember an elderly man living in that old schoolhouse at one time. I would see him cutting his small lawn. I remember the bell that was outside the house. Eventually he and the bell were gone, and the property was zoned commercial. A day spa attempted to use the building, but it did not prosper and went under. And so it sat vacant. I was drawn to that property. I suppose it’s natural. It’s a romantic notion to live in an old schoolhouse, maybe even to turn it into a bed and breakfast. For me, though, it was more of a gothic romance. I had thoughts of living in it alone, empty, haunting it like a ghost. I imagined sleeping on the bare, dusty, wooden floors. I imagined feeling the sunlight on my face as I stared down at passers by, seeing them, yet remaining unseen. I felt I was connecting with some consciousness that lived in that old schoolhouse. There also seemed to be some dark tie(s) to my property, I felt. Did John Hamilton, who first owned my land, also build the schoolhouse? Was he the first school teacher? Did he build a cabin on my property? Did my house sit on the former site of that cabin? One Christmas vacation my curiosity got the best of me. I had to see the inside of this old school. My future wife, Jill, set up a showing. We were allowed to take pictures of the property and record audio as I surveyed the site. Strange symbols above the front door of the schoolhouse. My first discovery that day left the strongest impression. 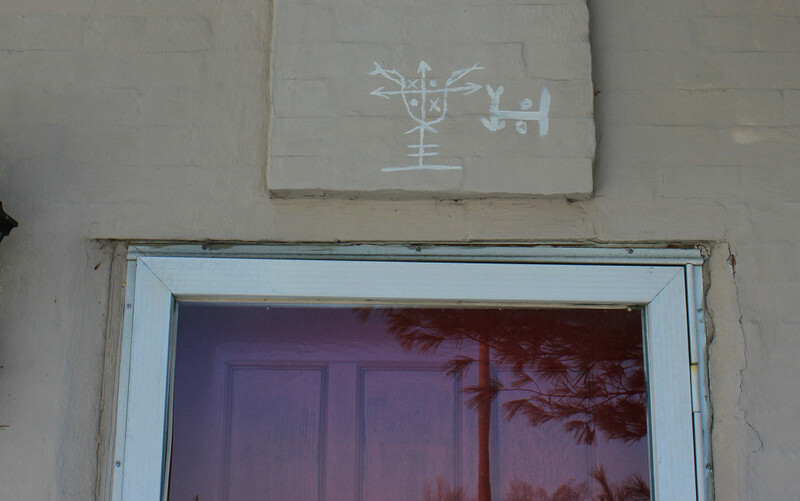 The off-white brick, two-story building had strange symbols above the front door. They weren’t simple, common symbols. They were elaborate symbols, painted with a small brush in white paint. I’d never seen anything like them. I then learned the strange symbols weren’t limited to the front door. They were above every door. 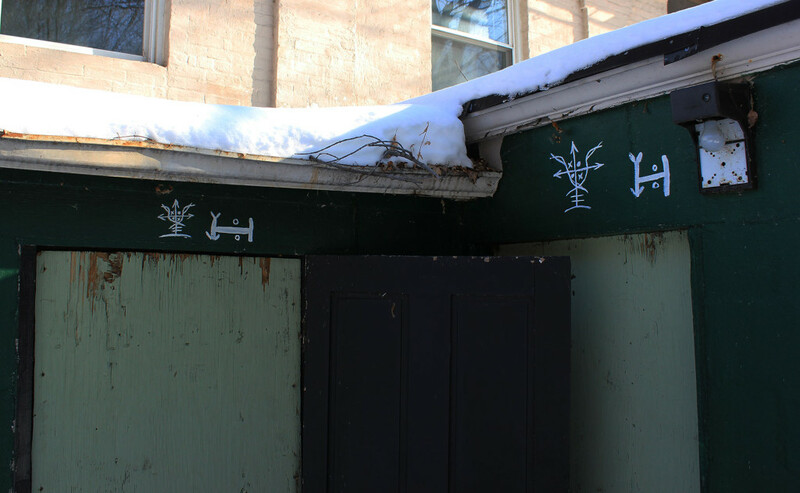 Not only that, there were similar symbols painted on the roof of the garage, only visible from within the house. At this point in time the paranormal activity in my house was in full swing. I wondered if I should have these symbols above my door. In part two, I detail some of the strange visitors to my house including the night the alien visitor came to call. The same strange symbols were repeated above the other doors.